Whole cells of Gluconobacter oxydans are widely used in various biocatalytic processes. Sorbitol at high concentrations is commonly used in complex media to prepare biocatalysts. Exploiting an alternative process for preparation of biocatalysts with low cost substrates is of importance for industrial applications. G. oxydans 621H was confirmed to have the ability to grow in mineral salts medium with glycerol, an inevitable waste generated from industry of biofuels, as the sole carbon source. 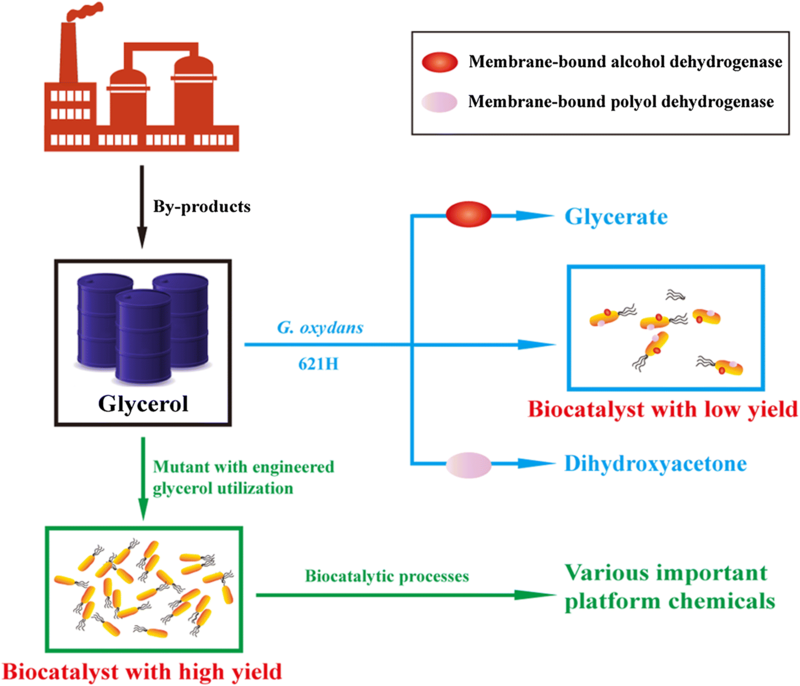 Based on the glycerol utilization mechanism elucidated in this study, the major polyol dehydrogenase (GOX0854) and the membrane-bound alcohol dehydrogenase (GOX1068) can competitively utilize glycerol but play no obvious roles in the biocatalyst preparation. Thus, the genes related to these two enzymes were deleted. Whole cells of G. oxydans ∆GOX1068∆GOX0854 can be prepared from glycerol with a 2.4-fold higher biomass yield than that of G. oxydans 621H. Using whole cells of G. oxydans ∆GOX1068∆GOX0854 as the biocatalyst, 61.6 g L−1 xylonate was produced from 58.4 g L−1 xylose at a yield of 1.05 g g−1. This process is an example of efficient preparation of whole cells of G. oxydans with reduced cost. Besides xylonate production from xylose, other biocatalytic processes might also be developed using whole cells of metabolic engineered G. oxydans prepared from glycerol. Gluconobacter oxydans is capable of incompletely oxidizing a large variety of carbohydrates and alcohols [1–3]. Whole cells of G. oxydans have been widely used in production of a variety of compounds such as vitamin C, dihydroxyacetone (DHA), xylonate and gluconate [4–8]. Traditionally, G. oxydans is cultivated in complex media with high concentrations of sorbitol and yeast extract . The high biocatalyst manufacturing cost might hamper the scale-up application of G. oxydans in biotransformation. To cope with this problem, several studies were carried out to prepare whole cells of G. oxydans from other carbon sources. For example, the membrane-bound glucose dehydrogenase (GDHK) in G. oxydans 621H was disrupted, and the mutant strain was laboratory-evolved with glucose as the sole carbon source and yeast extract as the nitrogen source. Whole cells of the evolved strain grown on a low concentration of glucose exhibited similar catalytic efficiency with the wild-type strain cultured on high concentrations of sorbitol . Glycerol is an inevitable waste generated during the production of biofuels such as bioethanol and biodiesel [11–15]. Approximately 1 kg of crude glycerol is produced during the production of 9 kg of biodiesel . The global annual production of glycerol is estimated to reach approximately 4.2 million tons in 2020 (OECD/FAO 2012) . The existing market for industrial application of glycerol is only 1 million tons/year . Therefore, it is desirable to develop new processes that can convert glycerol into high-value products such as DHA and glycerate [18, 19]. Besides an attractive substrate for the production of value-added products [19–21], glycerol can also be used as a cheap carbon source to culture various microbes (Additional file 1: Table S1). Whole cells prepared from glycerol can be used in lipids extraction (oil-accumulating microbes) or biocatalysis processes (microbes with different enzymes) [22–25]. G. oxydans 621H is able to utilize glycerol as the energy source in complex media and producing glycerate and DHA as the glycerol oxidation products [26–29]. Preparing whole cells of G. oxydans as biocatalysts using glycerol as the sole carbon source in mineral salts media is desirable for industrial processes. In this study, the glycerol utilization mechanism of G. oxydans 621H was elucidated. Then, a mutant strain that can grow with low glycerol consumption but high yield of biomass was constructed (Fig. 1). Whole cells of the mutant strain were prepared from glycerol and then used in the biotransformation of xylose into xylonate, an important platform chemical with versatile applications [30, 31]. Up to 73 g L−1 sorbitol is usually required for the growth of G. oxydans in complex media . In order to reduce the culturing costs, the growth of G. oxydans 621H in mineral salts media containing 10 g L−1 various carbon sources including glycerol, sorbitol, glucose, fructose, xylose, pyruvate, and lactate was firstly studied. As shown in Fig. 2, G. oxydans 621H can grow in mineral salts media with glycerol, sorbitol, or glucose as the sole carbon source. After culture for 24 h, ∆OD was 0.63 when G. oxydans 621H was grown in glycerol, which was higher than that of the strain cultured in sorbitol and glucose. Growth of G. oxydans in medium containing glucose proceeds in two metabolic phases . The fluctuation of ∆OD when G. oxydans 621H was grown in glucose might be due to the switch of different metabolic phases. The robust growth of G. oxydans 621H on glycerol was accompanied by the rapid consumption of glycerol and the accumulation of a large amount of DHA and a trace amount of glycerate (Fig. 3). After 24 h of culture, 10.8 ± 0.07 g L−1 of glycerol were consumed and the OD600 nm of G. oxydans reached around 0.9. DHA gradually accumulated to a final concentration of 9.26 ± 0.07 g L−1. The yield of DHA was 0.86 g g−1 glycerol, indicating that glycerol was majorly oxidized to DHA during the growth of G. oxydans 621H. As shown in Table 1, three putative enzymatic systems related to glycerol metabolism have been annotated in the genome of G. oxydans 621H . Glycerol can be catalyzed to glyceraldehyde by membrane-bound alcohol dehydrogenase that consists of two subunits (GOX1067 and GOX1068), and then glyceraldehyde will be oxidized to glycerate by aldehyde dehydrogenase. Glycerol can also be converted into DHA by the major polyol dehydrogenase that consists of two subunits, GOX0854 and GOX0855. There is also a glycerol utilization operon that consists of glpD encoding a glycerol-3-phosphate dehydrogenase (GOX2088), glpF encoding a glycerol transporter (GOX2089), glpK encoding a glycerol kinase (GOX2090), and glpR encoding a transcriptional regulatory protein (GOX2087). Glycerol can be transported into cells through GlpF, phosphorylated by GlpK to produce glycerol-3-phosphate (G3P) and G3P will then be dehydrogenated by GlpD to dihydroxyacetone phosphate (DHAP). DHAP will finally be channeled into central metabolism [35–37]. 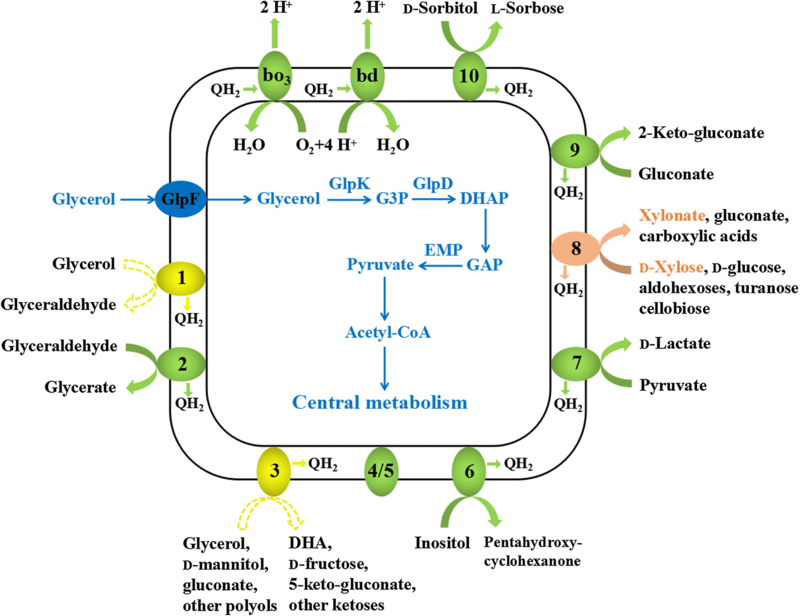 To identify the roles of these three enzymatic systems in glycerol metabolism and biomass production of G. oxydans 621H, four mutant strains including G. oxydans ∆GOX1068, G. oxydans ∆GOX0854, G. oxydans ∆GOX2088, and G. oxydans ∆GOX1068∆GOX0854 were constructed (Additional file 2: Fig. S1). G. oxydans ∆GOX0854 lost the ability to produce DHA, confirming that the major polyol dehydrogenase is responsible for DHA production. G. oxydans ∆GOX1068 produced 0.85 ± 0.06 g L−1 of glycerate but G. oxydans ∆GOX1068∆GOX0854 could not produce any glycerate, indicating that the membrane-bound alcohol dehydrogenase is responsible for glycerate production. As shown in Fig. 3a, only G. oxydans ∆GOX2088 could not grow in mineral salts medium with glycerol. Thus, the glycerol utilization operon is the sole system that is indispensable for biomass production from glycerol. On the other hand, the cells of G. oxydans ∆GOX2088 inoculated in the medium had polyol dehydrogenase activity and thus could consume glycerol and produce DHA with a low rate. Membrane-bound dehydrogenases are necessary for the utilization of certain substrates as the sole carbon source only if the substrate cannot be assimilated directly by G. oxydans. For example, G. oxydans can not directly utilize mannitol. G. oxydans first oxidizes mannitol into fructose by the membrane-bound polyol dehydrogenase, then fructose can serve as a direct carbon source for the organism . As shown in Fig. 3a, mutant of the membrane-bound dehydrogenases (the major polyol dehydrogenase and the alcohol dehydrogenase) only decreased the growth rate of G. oxydans 621H, but the biomass yield of G. oxydans ∆GOX1068∆GOX0854 was higher than other strains when glycerol was used as the sole carbon source. The presence of membrane-bound dehydrogenases can increase the growth rate of G. oxydans 621H through efficient energy generation by feeding electrons from the glycerol oxidation directly into electron transport chain. However, the glycerol oxidation process would also decrease the amount of glycerol that can enter the central metabolic pathway through glycerol utilization operon. G. oxydans 621H, G. oxydans ∆GOX1068, G. oxydans ∆GOX0854, and G. oxydans ∆GOX1068∆GOX0854 were cultured in mineral salts medium with glycerol for 48 h, then the yields of biomass and products were assayed (Table 2). The biomass yield of G. oxydans ∆GOX1068∆GOX0854 from glycerol was 0.199 ± 0.018 g dry cell weight (DCW) g−1, which was higher than that of other strains. No production of DHA and glycerate could be detected during the culture of G. oxydans ∆GOX1068∆GOX0854. Thus, preparing whole cells of G. oxydans ∆GOX1068∆GOX0854 as the biocatalyst from glycerol may be more economic feasible than other strains. Eight known and at least two unknown membrane-bound dehydrogenases genes have been annotated in the genome of G. oxydans 621H [38, 39]. These membrane-bound dehydrogenases can oxidize a wide range of compounds and can be used in various biocatalysis processes. Although G. oxydans ∆GOX1068∆GOX0854 lost two membrane-bound dehydrogenases catalyzing DHA and glycerate production, whole cells of the strain might be used in other chemicals production. For instance, the membrane-bound glucose dehydrogenase (GOX0265) has the ability to oxidize glucose, xylose, galactose, mannose, allose, and arabinose [38–40]. To identify the applicability of the whole cells of G. oxydans ∆GOX1068∆GOX0854 prepared from glycerol, the membrane-bound glucose dehydrogenase catalyzed xylose oxidation was selected as an example for further study. Dehydrogenase activities toward glucose and xylose in crude cell extracts of G. oxydans 621H and G. oxydans ∆GOX1068∆GOX0854 were assayed. As shown in Table 3, the glucose dehydrogenase activities of G. oxydans 621H cultured in the traditional complex medium with 18.4 g L−1 of yeast extract and 73 g L−1 of sorbitol (Y-S medium) toward glucose and xylose were similar to that of G. oxydans ∆GOX1068∆GOX0854 cultured in mineral salts medium with 10 g L−1 of glycerol (M-G medium). When G. oxydans ∆GOX1068∆GOX0854 was cultured in mineral salts medium with 10 g L−1 of glycerol, the glycerol consumed is less than 2 g L−1 (Fig. 3b). Thus, G. oxydans 621H and G. oxydans ∆GOX1068∆GOX0854 were cultured in mineral salts medium with different concentrations of glycerol and the growth of the strains was assayed (Additional file 3: Fig. S2). G. oxydans ∆GOX1068∆GOX0854 could grow to similar OD600 nm and exhibited similar dehydrogenase activity toward xylose in mineral salts medium with 2, 5, 10, and 20 g L−1 of glycerol (Fig. 4a and Additional file 4: Fig. S3). 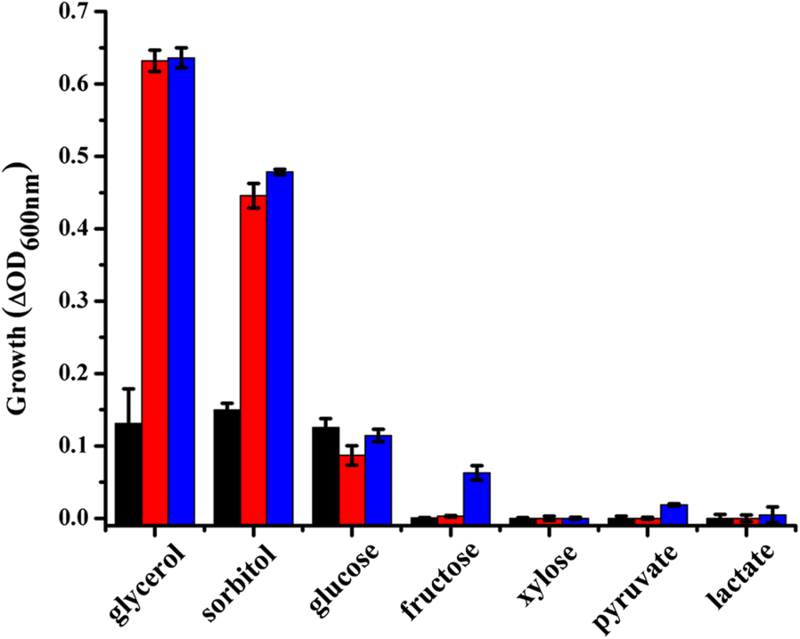 The culture system with 2 g L−1 of glycerol as the substrate exhibited relatively high biomass yield (Fig. 4b). Under identical conditions, the biomass yield of G. oxydans ∆GOX1068∆GOX0854 (0.161 ± 0.002 g DCW g−1) was 2.4-fold higher than that of G. oxydans 621H (0.067 ± 0.002 g DCW g−1) (Additional file 5: Fig. S4). Whole cells of G. oxydans ∆GOX1068∆GOX0854 can be prepared with a low glycerol consumption (2 g L−1) and may decrease the biocatalyst preparation cost. Production of xylonate from xylose was used to assay the biocatalytic performance of whole cells of G. oxydans 621H and G. oxydans ∆GOX1068∆GOX0854 prepared from 2 g L−1 glycerol. 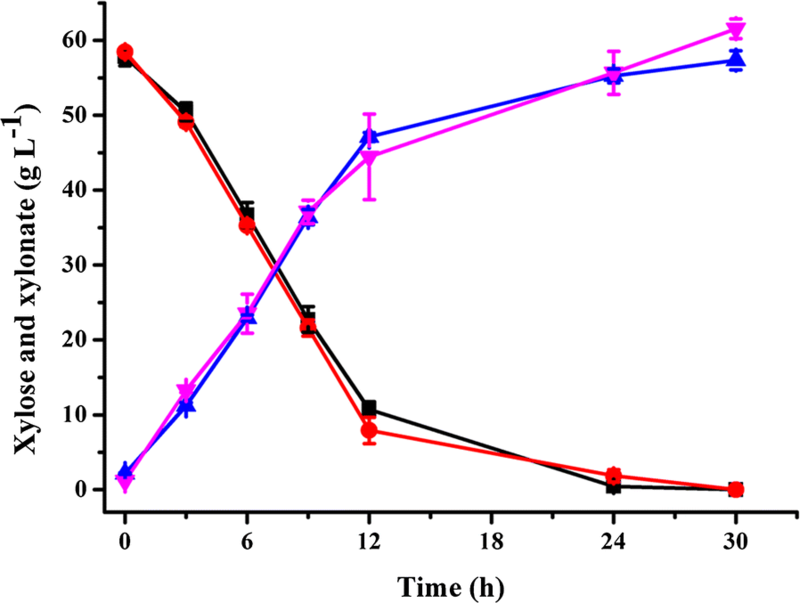 Biocatalysis was conducted at 30 °C in 20 mM potassium phosphate buffer (pH was adjusted to 7.0) with 60 g L−1 of xylose as the substrate and 7.8 g DCW L−1 of whole cells of G. oxydans 621H and G. oxydans ∆GOX1068∆GOX0854 as the biocatalysts. As shown in Fig. 5, after 30 h of biotransformation, up to 61.6 g L−1 xylonate was produced at a yield of 1.05 g g−1 by G. oxydans ∆GOX1068∆GOX0854. The specific yield of xylonate per unit cells was 7.90 g xylonate/g DCW. Xylonate at a final concentration of 57.4 g L−1 was produced with a yield of 0.99 g g−1 by G. oxydans 621H. The specific yield of xylonate per unit cells was 7.36 g xylonate/g DCW. Typically, whole cells of G. oxydans could be used as the biocatalysts in the industrial applications. Increased biomass yields from carbon sources used would lower the production costs of the biocatalysts. Therefore, various studies have aimed at increases of the biomass yields of G. oxydans 621H in complex media by metabolic engineering [9, 10, 41]. This study was the first study that focused on the construction of G. oxydans to lower the production cost in mineral salts medium. Glycerol, a chemical generated during the biofuel production, is a comparably cheap carbon source that can support the growth of G. oxydans 621H in mineral salts medium. Three enzymes’ systems related to glycerol metabolism including the major polyol dehydrogenase, the membrane-bound alcohol dehydrogenase, and the glycerol-3-phosphate dehydrogenase were predicted in genome of G. oxydans 621H . Their possible biological functions have been tentatively studied through gene deletion (Fig. 6). Complementation of these genes in the related mutant strains might further demonstrate their functions in the glycerol metabolism of G. oxydans 621H. The major polyol dehydrogenase and the membrane-bound alcohol dehydrogenase play no obvious roles in biocatalyst preparation but can decrease the glycerol channeled into biomass production. Thus, these two enzymes were deleted and the result strain G. oxydans ∆GOX1068∆GOX0854 only has the glycerol utilization operon and can efficiently transform glycerol into biomass with high yield and low glycerol consumption (Fig. 6). Eight known and two unknown membrane-bound dehydrogenases were predicted in G. oxydans 621H [38, 39]. Except to the major polyol dehydrogenase and the membrane-bound alcohol dehydrogenase involved in DHA and glycerate production, the activity of the membrane-bound dehydrogenases involved in other desired industrial applications might not be interfered. For example, production of xylonate from xylose with the membrane-bound glucose dehydrogenase was achieved using whole cells of the mutant strain prepared from glycerol. This biocatalyst might also be used in other oxidative biotransformation processes depending on the membrane-bound dehydrogenases of the strain. In this study, we develop a biocatalyst preparation process for G. oxydans 621H using biofuel’s byproduct glycerol as the carbon source in mineral salts medium. Two glycerol oxidation enzymes were deleted in G. oxydans 621H and the double knock-out strain could utilize glycerol with a higher biomass yield than that of the wild-type strain. Using the whole cells of the mutant strain as the biocatalyst, 61.6 g L−1 xylonate was produced from xylose in 30 h with high yield and high productivity. This research provides a low-cost and a renewable strategy for low cost production of whole-cell biocatalyst of G. oxydans, which may be used in various biocatalytic processes. The strains, plasmids and primers used in this study are listed in Table 4. G. oxydans 621H and its derivatives were cultured in a complex medium containing 73 g sorbitol, 18.4 g yeast, 1.5 g (NH4)2SO4, 1.5 g KH2PO4 and 0.47 g MgSO4·7H2O in 1 L of distilled water. A mineral salt medium containing 0.2 g l-glutamine, 2 g (NH4)2SO4, 0.2 g MgSO4·7H2O, 2.2 g KH2PO4, 0.2 g Na2HPO4, 5 mg nitrilotriacetic acid, 30 mg EDTA, 11 mg FeSO4·7H2O, 9 mg ZnSO4·7H2O, 0.6 mg CoCl2·6H2O, 2 mg MnCl2·4H2O, 0.6 mg CuSO4·5H2O, 9 mg CaCl2·2H2O, 0.08 mg NaMoO4·2H2O, 1 mg H3BO3, 0.2 mg KI, 0.5 mg calcium pantothenate, 0.4 mg nicotinic acid, 0.4 mg p-aminobenzoic acid, and different carbon sources in 1 L of distilled water were also used . G. oxydans strains were grown at 30 °C and 200 rpm in 250 mL baffled Erlenmeyer flasks. E. coli strains were cultivated at 37 °C in Luria–Bertani medium (yeast 5 g L−1, tryptone 10 g L−1, NaCl 10 g L−1) at 37 °C and 180 rpm on a rotary shaker. Antibiotics were used when necessary at the following concentrations: kanamycin at 50 μg mL−1, ampicillin at 100 μg mL−1 and 50 μg mL−1 cefoxitin. Molecular biological techniques were carried out using standard protocols . Genomic DNA of G. oxydans 621H was extracted through the Wizard Genomic DNA Purification Kit (Promega, Madison, WI, USA). Polymerase chain reaction (PCR) primers were obtained from Sangon (Shanghai, China). Restriction enzymes were obtained from Thermo Fisher Scientific (USA). T4 DNA ligase and fastPfu DNA polymerase were purchased from MBI (USA) and Transgen Biotech (China), respectively. G. oxydans 621H was transformed via a triparental mating method as described previously [39, 44]. All the constructed strains were validated by DNA sequencing done by Sangon (Shanghai, China). Genes of G. oxydans 621H were deleted using the pK18mobsacB system as described previously . Briefly, the homologous arms upstream and downstream of the target GOX1068 gene were amplified by PCR with the genomic DNA of G. oxydans 621H as the template, and the primers GOX1068up.f/GOX1068up.r and GOX1068down.f/GOX1068down.r. Then they were fused together by the recombinant PCR using primers GOX1068up.f/GOX1068down.r, which contained EcoRI and BamHI restriction enzyme sites, respectively (Table 4). The generated fusion construct and pK18mobsacB , a mobilizable plasmid that does not replicate in G. oxydans, were digested with EcoRI and BamHI, and then linked by using T4 DNA ligase to form pK18mobsacB-∆GOX1068. The plasmid was transferred into G. oxydans via a triparental mating method . E. coli DH5α harboring pK18mobsacB-∆GOX1068 was used as the donor strain, E. coli HB101 harboring the plasmid pRK2013 was used as the helper strain, and G. oxydans 621H was used as the recipient strain. 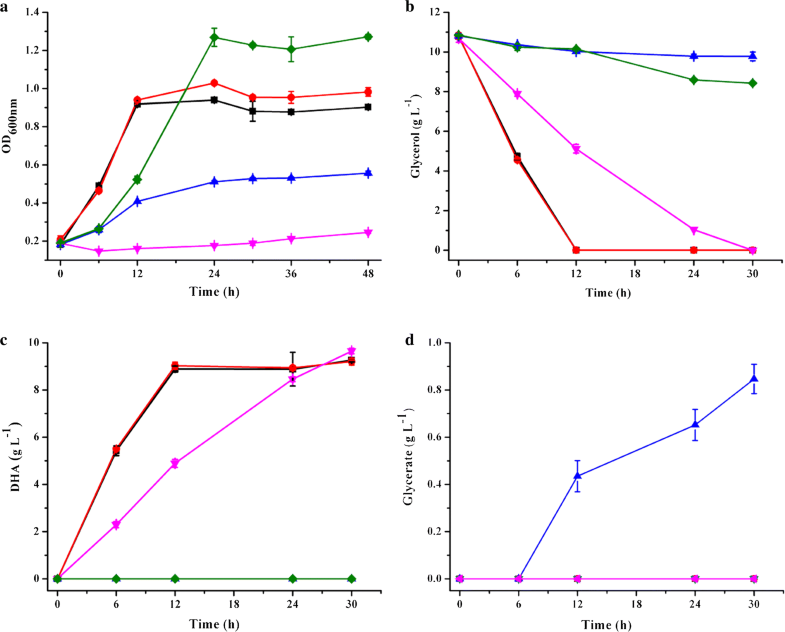 The first crossover cells containing the integration of the plasmid pK18mobsacB-∆GOX1068 into the chromosome of G. oxydans 621H were selected on the complex medium agar plate supplemented with 50 μg mL−1 kanamycin, 50 μg mL−1 cefoxitin, and 0.1% (vol/vol) acetic acid . The second crossover cells were singled out by culture on the complex medium plates containing 10% (w/v) sucrose. Other mutants of G. oxydans 621H were generated by using the same procedure and primers listed in Table 4. All mutants were verified by PCR and sequencing. The oxidation of glucose and xylose in G. oxydans 621H was majorly catalyzed by membrane-bound glucose dehydrogenase, which can be assayed using DCPIP as the electron acceptor . Cells of G. oxydans 621H and its derivatives were collected, washed, and then resuspended in phosphate-buffered saline (pH 7.4 PBS) supplemented with 10% v/v glycerol and 1.0 mM phenylmethylsulfonyl fluoride (PMSF), and lysed by sonication on ice. Cell debris was removed through centrifugation (13,000 rpm, 20 min). The activities of membrane bound glucose dehydrogenase were assayed by monitoring the change in absorbance at 600 nm corresponding to the reduction of DCPIP with a UV/visible spectrophotometer (Ultrospec 2100 pro, Amersham Biosciences, USA). The reaction was carried out in 0.8 mL of pH 7.4 PBS, containing 20 mM PMS, 50 mM DCPIP, 25 mM glucose or xylose and 40 μL crude cell extracts. G. oxydans ΔGOX1068∆GOX0854 were cultivated in mineral salts medium with 2 g L−1 glycerol at 30 °C and 200 rpm for 36 h. The cells were harvested, washed twice with PBS (pH 7.4), and then resuspended in the same buffer. The biotransformation reactions were carried out at 30 °C and 150 rpm in 20 mM potassium phosphate buffer (pH was adjusted to 7.0) containing 7.8 g DCW L−1 of whole cells of G. oxydans 621H or G. oxydans ∆GOX1068∆GOX0854 and 60 g L−1 of xylose. Samples were taken every 3 h and centrifuged at 13,000 rpm for 5 min before being analyzed. The biomass was evaluated by determination of optical density (OD) at 600 nm with a UV/visible spectrophotometer. Optical densities of whole cells were converted to DCW as Y = 0.3896 × OD600 nm − 0.0004. The protein concentration was determined by the Lowry procedure using bovine serum albumin as the standard . The samples obtained from the biotransformation experiment were filtered through a 0.22 μm filter prior to high-performance liquid chromatography (HPLC) analysis. Glycerol, glycerate, and DHA were quantified using an Aminex HPX-87H column (300 × 7.8 mm; Bio-Rad, USA) equipped with a RID-10A refractive index detector. Xylonate was quantified by an Aminex HPX-87H column (300 × 7.8 mm; Bio-Rad, USA) equipped with a SPD-M20A photodiode array detector at 210 nm. The analysis was carried out at 55 °C using 10 mM H2SO4 as the eluent at a flow rate of 0.4 mL min−1. Xylose was analyzed using an Aminex HPX-87P column (300 × 7.8 mm; Bio-Rad, USA) equipped with a RID-10A refractive index detector at 65 °C and the mobile phase was deionized water at a flow rate of 0.6 mL min−1. A series of injections of standard substances in the range of 0–10 g L−1 was used to obtain calibration curves. CM led, designed, and coordinated the overall project, with contributions from CG and PX; JY, CG, PX and CM wrote the manuscript with input from all authors. JY and JX analyzed the glycerol utilization pathways in G. oxydans 621H; JY prepared whole cells of G. oxydans 621H and performed the xylonate production experiments; MC, ZL, CX and XW performed the enzymatic activity assays. All authors read and approved the final manuscript. The work was supported by National Natural Science Foundation of China (31470164, 31670041), Special Funds for Public Welfare Research and Capacity Building in Guangdong Province of China (2017A010105020), the Shandong Provincial Funds for Distinguished Young Scientists (JQ 201806) and the Young Scholars Program of Shandong University (2015WLJH25). 12934_2018_1001_MOESM1_ESM.pdf Additional file 1: Table S1. Price comparison of different carbon sources. 12934_2018_1001_MOESM2_ESM.pdf Additional file 2: Fig. S1. PCR confirmation of the disruption of genes. a. adhB (GOX1068); b. sldA (GOX0854); c. adhB and sldA (GOX1068GOX0854); d. glpd (GOX2088). M: 5K Marker; WT: the genomic DNA of wild-type G. oxydans 621H; +: pK18mobsacB-ΔGOX0854 (b), pK18mobsacB-ΔGOX2088 (d); -:H2O. 12934_2018_1001_MOESM3_ESM.pdf Additional file 3: Fig. S2. Consumption of substrate of G. oxydans ΔGOX1068ΔGOX0854 in mineral salts medium containing different concentrations of glycerol. (Black square) 1 g L−1, (red circle) 2 g L−1, (blue triangle) 5 g L−1, (green inverted triangle) 10 g L−1, (pink left-pointing triangle) 20 g L−1. 12934_2018_1001_MOESM4_ESM.pdf Additional file 4: Fig. S3. Dehydrogenase activity toward xylose of G. oxydans ΔGOX1068ΔGOX0854 cultured in mineral salts medium containing different concentrations of glycerol. 12934_2018_1001_MOESM5_ESM.pdf Additional file 5: Fig. S4. The dry cell weight and biomass yield of G. oxydans 621H in mineral salts medium containing different concentrations of glycerol. Dry cell weight (red), biomass yield (black). The biomass yield was calculated based on concentrations of the cells and added glycerol. Calculation of dry cell weight: g DCW L−1 = 0.3896 × ΔOD600 nm − 0.0004.